Dr. Lourice Abdelmelek is a board certified physician for the Department of Family and Community Medicine at McGovern Medical School at UTHealth. Dr. Abdelmelek primarily treats adolescents, adults and seniors. She has also received several awards during her career. 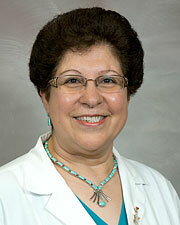 Dr. Abdelmelek is a Diplomate of the American Board of Family Medicine. When Dr. Abdelmelek is not caring for her patients, she enjoys reading and interior decorating. I love Dr. Abdelmelek! She's thorough, listens, and engages me in my care. I love Dr.A. She is the best Doctor ever. She really cares about her patients. I love Dr Abdelmelck I always feel better seeing her even before I get my medicine. she makes me feel calm and at ease. doctor was concerned about my health. she took me to x-ray & asked me to come back next week for an EKG. *Dr. Abdelmelk is always excellent. dr abdel is an excellent dr. she listens attentively + w concern. remembers past details abt me. she's like an old friend. she asks abt my family, [...] house, shares abt herself. these are qualities i value in my doctor in conjunction with her medical knowledge. dr A is a great doctor. Dr A doesn't generally discuss what one of my other doctors have said. She generally just talks to me as she feels I need to make the decision. I completely trust her. I don't like having to see other doctors in the group. My doctor knows me and is familiar with my medical history so getting an appointment with her shouldn't be so hard. Dr. melek is very kind and here me very well and give me full attention. My doctor is very professional. I've been with her since I moved here to Houston. Appear to be a problem with the pharmacy & clinic on refills. *Dr. "A" is the BEST!! *Dr. Abdelmelek is one of the finest & knowledgeable drs. I know. Dr. Abdelmelick is a messenger from God, she care about her patients like her own family. My entire [...] loved her because she care about our wellbeing. When I found out she was not on the list of doctors who don't accept my choice of coverage, I changed my insurer to [...] not to lose her. She is the best family DR. in Houston, may be in the nation. The bottom line is she cares. Dr. Abdelmelek is very knowledgable and caring.